Your teeth are meant to last for a lifetime with the right care. Unfortunately, that does not always happen. Tooth loss remains a prevalent problem. To regain a complete smile, many people rely on dentures in Corbin. 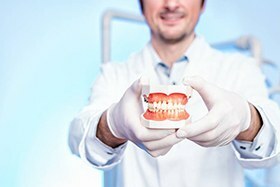 Although they have a bad reputation for looking and feeling fake, several advancements in dentistry over the years now make them more realistic than ever. At Corbin Family Dental Care, we will complete your smile using an aesthetically pleasing and comfortable solution. Why Choose Corbin Family Dental Care for Dentures? Every tooth is vital to your ability to chew and speak. When you are missing several or all your teeth, your quality of life and general health suffer. Now, you must limit the foods you eat because they become too difficult to chew. This can lead to nutritional deficiencies that can impact your health over time. You will also have a harder time pronouncing certain works clearly, making your speech sound slurred. It is easy to feel insecure about your incomplete smile, but you can restore your confidence and oral functions with the right denture. They are an affordable and convenient solution to replace your missing teeth. You can regain your ability to chew, speak, and smile with the help of your restorative dentist in Corbin, Dr. Katherine Whitaker. Partial: A partial denture is used to replace several missing teeth. Prosthetics are attached to a gum-colored base, which features a metal framework. This allows it to clip or clasp onto your remaining teeth to hold in place. Conventional: A removable denture is placed in your mouth after your tissues have healed from tooth extractions or other procedures. Immediate: The denture is placed the same day as your tooth extractions, so you do not need to be without teeth while you heal. You will need adjustments in a few months. 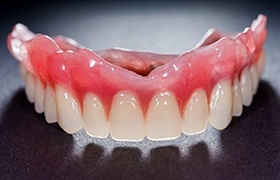 Overdenture: If some of your teeth can be preserved, an overdenture can fit over them while filling the space of those that are missing. Your initial consultation ensures your gums and soft tissue are healthy to support the denture. Besides a visual examination, x-rays are taken to see your oral structures. Based on the information, you may need additional treatments, like tooth extractions. 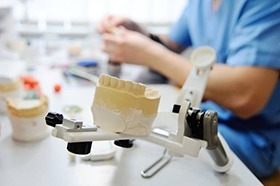 Measurements and impressions are taken to craft your denture to meet your exact needs. The amount you will pay for your new smile is based on several factors, such as the materials used, how many teeth you are replacing, and your dental coverage. We help you maximize the value of your policy to reduce the amount you need to pay out-of-pocket. We accept third-party financing to cover the remaining balance. Dentures allow you to invest in your quality of life and your confidence. Contact our office today to schedule your consultation to replace your missing teeth. We look forward to completing your smile.